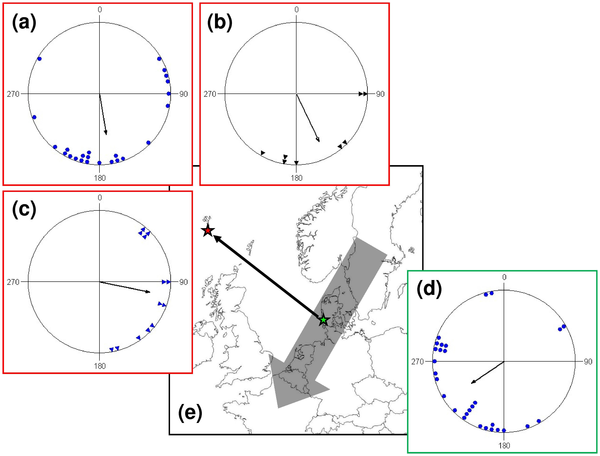 Thorup et al start out with and introduction explaining that little is known about how juvenile migratory birds compensate when they are displaced during migration. We know that juveniles have some sort of navigational system allowing them to find their way to wintering grounds and back to breeding grounds the following year, but this wouldn’t be enough for them to find their way if they ended up in the wrong place because of wind, for example. So far, it has been very difficult to study migrating birds, but this study attempts to find out whether juveniles can compensate for displacement even though they’ve not had the chance to learn where to go yet. To do that, they displaced some juvenile passerines 1100km from Denmark to the Faroe Islands and carried out two different experiments. One investigates how the bird orients when it has a view of the night sky (these were nocturnal migrants), and the other involved releasing the birds after attaching tiny transmitters to them using glue. They found that when juvenile birds were orientation tested (in funnels, sounds like good fun) they changed their orientation. The same was the case for the direction of flight once released. (a–c) Orientation on the Faroe Islands: (a) in funnels of birds displaced from Denmark to the Faroe Islands, (b) vanishing bearings of birds caught on the Faroe Islands, (c) vanishing bearings of birds translocated from Denmark to the Faroe Islands. (d) Orientation in funnels of birds caught and tested in Denmark. (e) Map of Northwest Europe showing the location of the Faroe Islands (red star) and the main migration through Northwest Europe (grey arrow). The 1100 km displacement from Denmark (green star) to The Faroes is shown by the thin arrow. In circular diagrams, the orientation of individual birds is marked on the periphery of the circle and the mean sample orientation is shown as a black arrow starting in the circle centre and with its length relative to the radius corresponding to the length of the mean vector r. 0 corresponds to orientation toward North. All sample orientations differ significant from random according to the Rayleigh test (P<0.05). As you can see from the diagram above, there is a lot of scatter, and although the direction of orientation is significantly different in displaced birds, than it is in birds on route, it could not be determined if the birds were simply trying to get back to where they were, or if they were trying to adjust their migratory route according to where they had ended up. However, it seems pretty clear that the birds are at least able to make general changes in their migration to compensate for displacement. Whether that be by returning to were the went off route, or by readjusting their direction. The authors speculate on how the bird manage to navigate and mention magnetic cues as the main candidate although olfactory cues as well as celestial cues are options too. Given that it is often cloudy on the migratory route of these birds and that olfactory cues don’t travel very well up wind making them very weather dependent, magnetic cues seem more likely. Especially considering how inexperienced migrants seem to be affected by changes in the magnetic field. I liked this article because it’s such a simple experiment to resolve such a simple question. “Can juveniles migratory birds compensate for displacement?”. Answer: Yes they can. However, as so often is the case with these simple questions, it throws up a whole new host of questions. Which type of compensation is it? Do they go back to where they were displaced from, or do they carry on towards their goal? How do they know which way to fly to get back on track? Where do the birds that have been displaced end up? Thanks for posting a link to this blog post on the article! Thanks for sharing, I haven’t come across PLoS ONE yet, I’ll have to check it out. I also often end up with more questions when I read and keep reminding myself that I’m not going to be able to answer them all during the course of my PhD, however much I’d like to! Yeah, there are too many answers for one PhD or even one lifetime of research. Luckily there are lots of people working on it. Thanks, and the same to you, although it’s not quite as new.